Six Somalis have gone on trial in Paris charged with taking the crew of the sailing ship Le Ponant hostage in 2008. 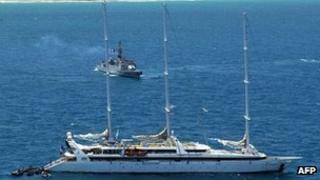 The luxury French yacht was boarded by armed pirates in the Gulf of Aden as it was travelling from the Seychelles to Yemen to pick up passengers. One of the defendants admits piracy, two say they were on the boat but only to sell goats and cigarettes, and the others deny ever being on board. French commandos arrested the men shortly after the crew were released. They carried out a helicopter raid in Somalia, intercepting a 4x4 vehicle. There was $200,000 (£126,000) in the vehicle, which was said to be part of the ransom money paid by the ship's owner. One of the defendant's lawyers, Martin Pradel said: "It was six men stopped in a taxi," and insisted there was no forensic evidence to link his client to the crime, the AFP news agency reports. But Michel Quimbert, a lawyer for some of the plaintiffs, reportedly said: "These men were in possession of part of the ransom and weapons when they were arrested.... [and] were identified by the majority of crew members". In court the defendants spoke through interpreters and gave their professions as four fishermen, a taxi driver and an accountant. If convicted they face life in prison. About 20 Somalis are currently being held in France in connection with four cases of piracy and taking hostages. Last year a Paris court jailed five pirates for another hijacking in the Gulf of Aden in 2008. Somalia has not had a fully functioning government for two decades, so international forces have stepped in to try to curb the problem of piracy off the Somali coast. The United Nations Convention on the Law of the Sea defines piracy as a universal crime and gives sovereign nations the right to seize and prosecute pirates, so there have been a number of trials in other countries.